A retired University of Southern Maine professor is barred from teaching at the school after offering students class credit to protest the state’s Republican Sen. Susan Collins so she’d oppose confirming then-Supreme Court nominee Brett Kavanaugh. “In response to her inappropriate actions Dr. Susan Feiner has been notified that she is now barred from teaching at the University of Southern Maine, a prohibition that will be upheld by the other campuses of the University of Maine System as well,” USM President Glenn Cummings said in a statement Wednesday, the Portland Press Herald reported. 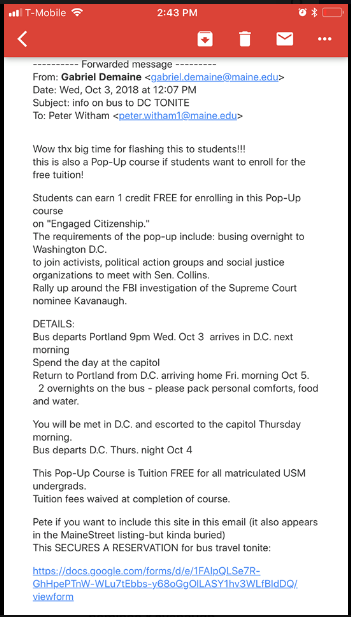 USM students could earn one free credit for enrolling in the pop-up course “Engaged Citizenship,” according to an email obtained by the Maine Republican Party. “Rally up around the FBI investigation of the Supreme Court nominee Kavanaugh,” the pop-up course’s description said. Cummings was unaware of the course being offered and stopped it immediately, according to his press statement from Oct. 4. Feiner said she will not appeal the university’s decision. She was a tenured professor in economics for 21 years and retired in September. “I’m retired. It’s USM’s loss,” she said in a text to the Herald. Feiner also said “hundreds of thousands (of dollars) in planned giving is gone,” according to the Herald. Retired faculty can teach a course or two after they retire, the Herald reported. Kavanaugh was confirmed on Oct. 6 with a 50-48 vote. USM did not immediately respond to TheDCNF’s request for comment.